Off-grid messaging app FireChat is giving its users the option of lifting their anonymity and verifying their identities for other users to see. The first 15 verified accounts popped up in FireChat feed and chatrooms this week, almost all of them belonging to Hong Kong-based journalists that have been using the app to communicate in thick of anti-government protests. The ongoing protests in Hong Kong have shone a spotlight on FireChat as a tool for dissident communications, but it’s also become a public forum for people to spread misinformation and cause panic. FireChat’s creator Open Garden is hoping this update to its Android app (a iOS update is coming shortly, Open Garden said) will help journalists in Hong Kong establish their credibility in a sea of anonymous messages. 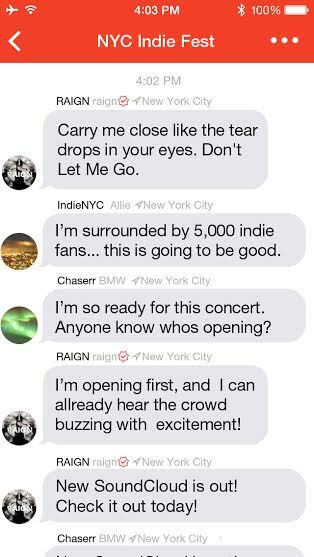 Verified users will see a badge containing a check mark (similar to Twitter’s verification icons) appear next to any message posted in FireChat, and any user can access the user’s profile, which gives details about their identity and affiliation. The verification status also persists if users move off the internet and into peer-to-peer communications mode. FireChat is unique among messaging apps in that it works without an internet connection. FireChat-enabled devices connect to one other directly using their Bluetooth and Wi-Fi radios, creating ad-hoc networks among any FireChat users nearby. That capability one of the main reasons OpenGarden has proven so popular among Hong Kong protesters facing congested cellular networks and the possibility that the government will start blocking internet communications. As for how people get verified, Open Garden is taking requests at verified@opengarden.com, but at least for now the San Francisco startup is being very particular about who its accepts as it cements its verification process and policies. “We are very careful with the selection process, and will grow the number of verified accounts only progressively,” Open Garden CMO Christophe Daligault told me. The focus of the verification program today is primarily on Hong Kong because the protests are ongoing, and among the first to get his check mark was Patrick Boehler, a reporter for the South China Morning Post and journalism teacher at the University of Hong Kong (most protest organizers and activists have chosen to remain anonymous). But Open Garden will open the program to other public figures. 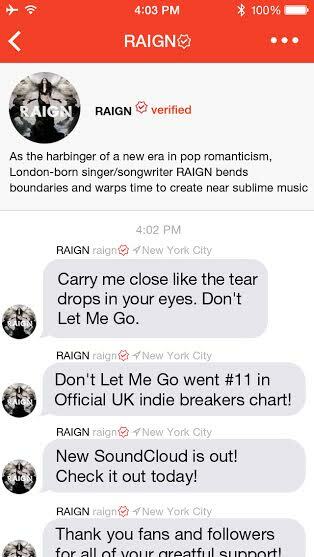 It has already verified one celebrity, U.K. singer RAIGN (a favorite of Open Garden CEO Micha Benoliel). While Open Garden hopes the verification program while help create trusted voices people can turn in highly chaotic situations like the protests, FireChat still remains an open platform where the vast majority of users remain unverified and are free to post any message behind anonymous user names. There will still be people screaming “fire” in crowded chatrooms. In the coming months, Open Garden also plans on introducing a private messaging feature, which protesters can use to create closed user groups both off the grid and on the global internet proper. Those communications will also be encrypted, hopefully keeping them hidden from prying eyes, Daligault said. Since the Hong Kong protests started nearly two weeks ago, FireChat has seen 460,000 downloads in the territory and Open Garden has hosted 5.1 million chat sessions from Hong Kong alone on its servers. And that doesn’t even count the hyperlocal sessions being set up at the protest sites. Since those sessions are off the grid, Open Garden never sees that traffic.